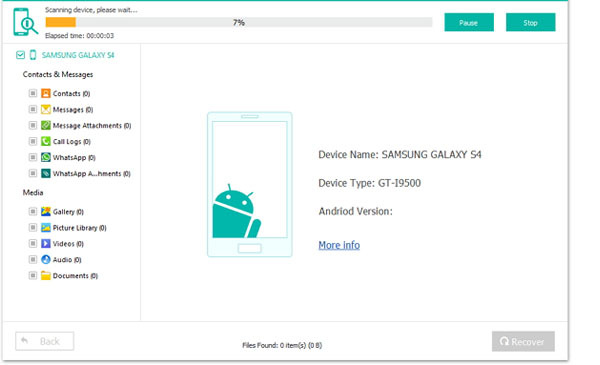 Home> Resource> Android Recovery> How to Recover Data from Water Damaged Android Phone or Tablet? How to Recover Data from Water Damaged Android Phone or Tablet? "One of my friend dropped her new-purchased Samsung Galaxy S8 into the water, and she picked the phone out soon. But after the phone get dried, she turned on the device and find some important contacts and photos have been gone. Then she feel worried and wish to find a method to get back the lost data." It is reported that many Android users have suffered this "Disaster" with the popularity of smart phones, and if you're one of them, what will you do here? Today, we will guide you through the tutorial on recovering data or files from water damaged Android devices step by step. Part 2: How to Recover Data from Water Damaged Android Phone? Emergency: How to Reduce the Data Lost to the Least? 3) Wrap the device with cloth or handkerchief for a few minutes, and then turn off your phone, and place it into a jar or a bag filled with rice for a couple of days. If you have tried the above solutions, but there are still something wrong on your Android, such as fail to boot, data lost and so on. You can try the below solutions to get back your lost data on water damaged Android. After a few days, now you can turn on your phone and it works well. If you're lucky, you may find all things are kept well here. But if you find something important are lost, don't worry, you can ask for help from MobiKin Doctor for Android (Windows/Mac). However, you should be noted that if your Android stuck in black or non-responsive screen after dropping into water, this program will be useless for you and you need to take the second solution to get back the lost data. 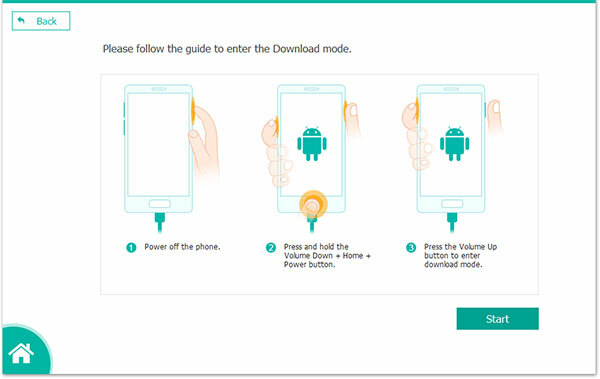 Step 1: No matter which brand of your Android device is, just connect your device to the computer with USB cable, then follow the instructions on how to enable USB debugging on your device. Note: If you wish to conduct a comprehensive scanning on your device, then please root your Android phone or tablet before connecting it to the computer. After that, you can launch the program and it will detect your device automatically. Step 2: Files on your Android have been categorized and displayed on the interface. Tick off these data types you want to recover back and click "Start" button to let the Android data recovery program scan your Android phone. Step 3: When the scan is finished, you can preview the scanned out data, find and mark the data you wish to restore and hit "Recover" button to save them on your personal computer without losing. How to Extract Data from Water Damaged Android (Black, Non-responsive Screen, etc.)? 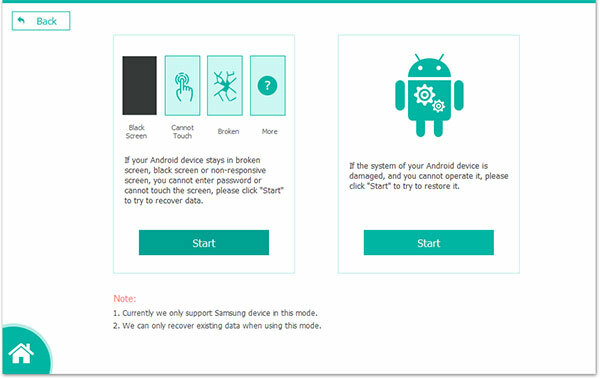 If there is something wrong on your water damaged Android phone, such as black screen, non-responsive screen or you cannot touch the screen and so on, you can follow the below guide to fix these issues and extract the existing data from Android as you like. But here, you need to download and install a program called Broken Android Data Extraction. With it, you can get access to a damaged Android without locking the screen or enabling USB debugging. Step 2. 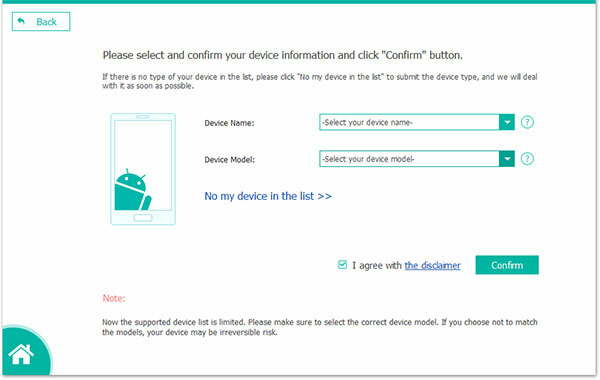 Click "Start" button to confirm your device information. Then hit "Confirm" button to enter the next step. Step 3. Follow the onscreen instructions to enter the Download mode, then click "Start" button to begin to scan for files. Step 4. When the scanning is finished, you can preview the results in the form of folder. Then select the data you wish to extract and save on the desktop computer. After trying the above solutions, have you found all your lost data from a water damaged Android phone or tablet? Actually, we hope this post is really useful for you and if you have any other suggestions, please discuss with us by leaving a comment. How to Recover Deleted Files from LG Optimus for Windows/Mac? How to Recover Deleted Photos from Motorola Droid/Atrix/Xoom, etc.? How to Recover Deleted Videos from Samsung Galaxy?